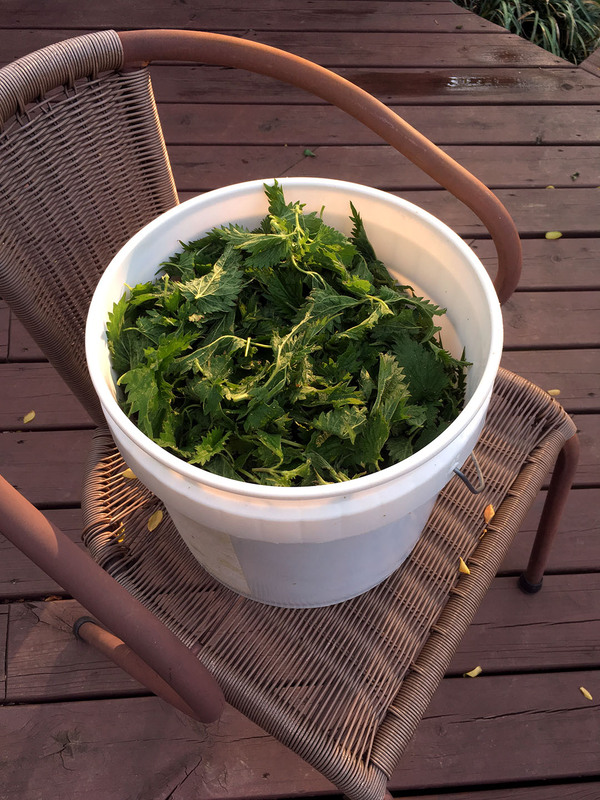 I recently harvested a really big batch of nettles from a friend’s yard. It took up two plastic grocery bags. Spring came late this year so they hadn’t started flowering yet and were lush and green. 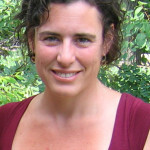 I often cook with nettles, making steamed greens or fresh pesto or sautéed with other veggies and some kind of meat. 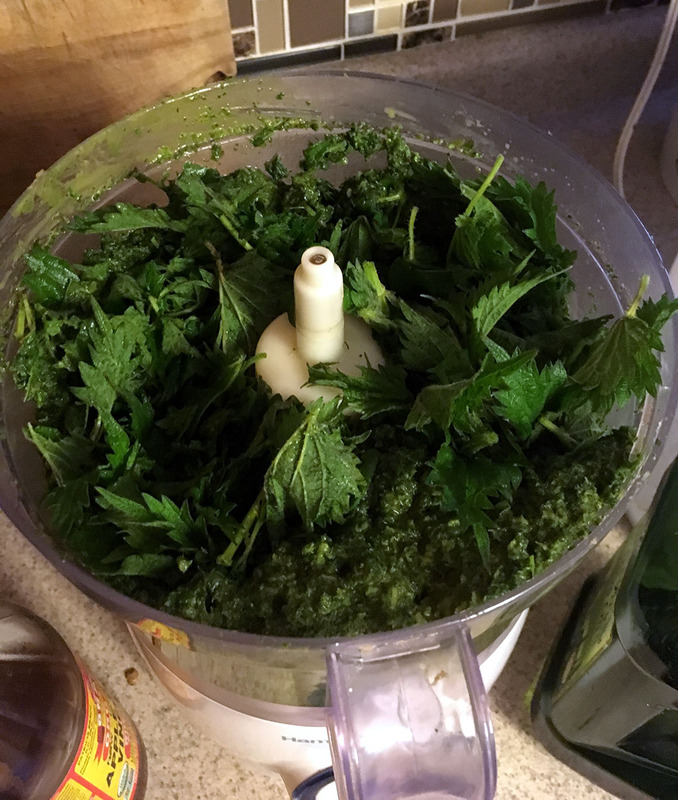 Nettles do have stingers (actually light hairs that irritate our skin), but even light cooking or running them in the food processor renders the stingers ineffective. After much soaking and rinsing in the sink and making a big mess, I realized the washing machine would be perfect. It would not only provide a big batch a water for rinsing, it would agitate the leaves (thus knocking all the aphids off), and it would spin like a giant salad spinner which would dry all the leaves. This turned out to be a brilliant idea. Which is great because plenty of my outrageous ideas do not turn out to be brilliant. The leaves were all in tact, the aphids all gone, and the entire batch was completely dry. 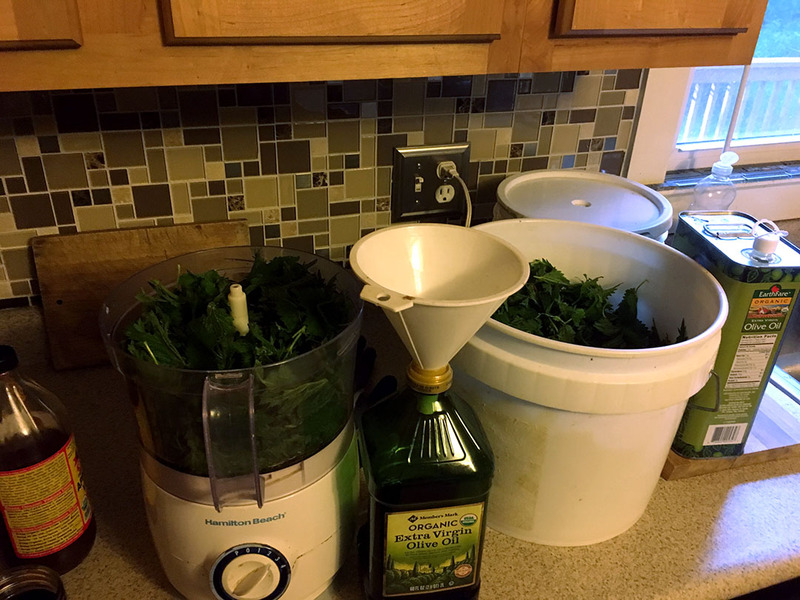 Harvest the nettles—wearing gloves!—by cutting the top third or half of each plant. They’ll grow back heartily. If you can’t process them immediately, keep them in a cool and dark place. While still wearing your gloves, remove all the nettles leaves from the stems. The stems are too woody to be used in cooking. If you have aphids on the nettles, soak the leaves in cold water for 10 minutes. This will kill all the aphids. 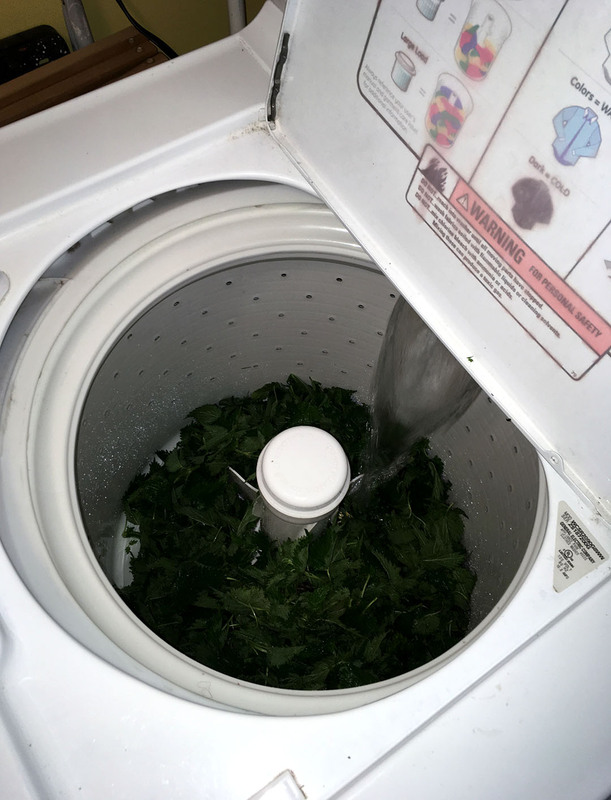 Drain the nettles from the soaked water and dump them into the washing machine. Adjust the machine to the size load you’ll need. I used the smallest setting on my machine. Set the washing machine to rinse and spin only. Once the cycle has ended, remove the nettles. I noticed that while most of the stinging hairs were disarmed after going through the washing machine, the leaves were very much in tact. The aphid bodies just dissolved and faded away. There were none left after the cycle in the machine. Wipe out the leaf bits from your washing machine. Now you can dry the nettles for use in infusions (tea) or medicine making (tincture), or you can cook with the nettles. The more tender the nettles, the more palatable they are. As I mentioned, you can stir fry, steam, make soup (even cold summer soup), or pesto. Wash and spin dry your nettles. Put a big handful in the food processor. Add in a generous amount of olive oil. Food process the heck out of it and keep adding liquids mentioned above until it’s the consistency you like. Add a Tablespoonful or more of Miso. I don’t use nuts or garlic because I’m allergic to both, but feel free to improvise in all ways. 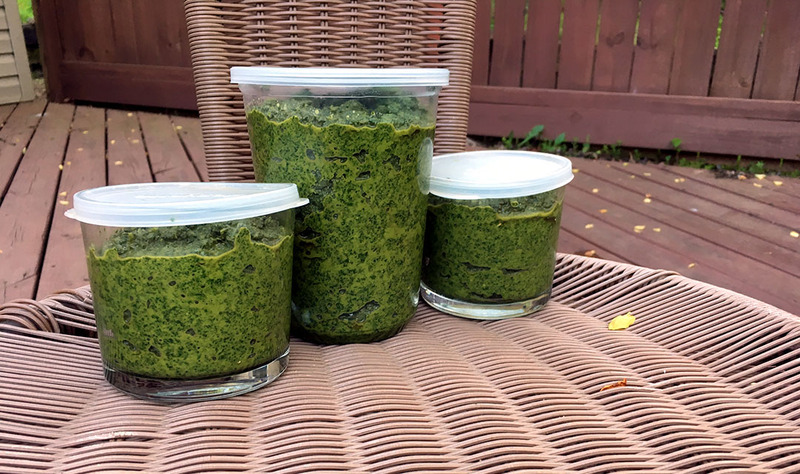 Pesto is a living and breathing recipe that can be amended based on the ingredients you have on hand and your temperament in the moment. Eat on toast, pasta, tomatoes, and more. Feel free to heat it as well and make a warm sauce out of it. It keeps well in the freezer.